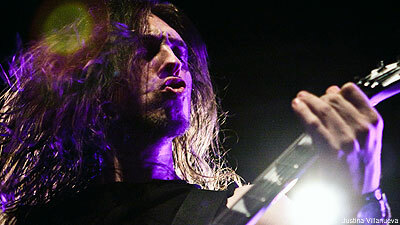 "Bow down to the thrashers" is how Evile frontman Matt Drake started off the band's mighty set at New York City's Nokia Theater on March 6. For a band that hasn't even been around for a decade, they received an intense crowd response. As soon as lights hit the band, people literally ran from the merch area to the center of the venue. And they were all screaming, "Evile!" The band was delighted to finally make it to America. They've had a heck of an emotionally exhausting year, with bassist Mike Alexander passing away in October. Alexander died from a pulmonary embolism while the thrashers were on tour with Amon Amarth. The tragedy took a toll on the Earache community, but the band decided it was best to continue spreading the Evile. "Everything is bigger and better. Your policemen have guns. Ours have big sticks," the U.K.-bred guitarist and vocalist said about the differences between home and the dead heart of tourist New York City: Times Square.